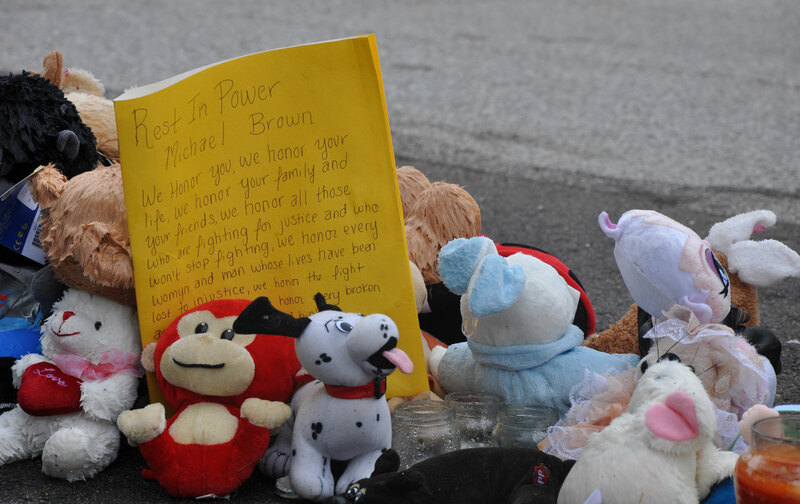 FERGUSON, Mo.—On a humid Sunday morning, hundreds crowded around a makeshift memorial on Canfield Drive, a pile of flowers and stuffed animals soaked by an evening of rain. They gathered to remember and to hear the words of community leaders, poets and a grieving father. Right around 12:02 PM, the crowd observed four and a half minutes of silence before walking en masse to a nearby church. Exactly one year ago, on this same stretch of suburban road, Michael Brown’s body lay on the pavement for four and a half hours. Crowds gathered. Protests erupted. A convenience store went up in flames. Police arrived on the scene with armored vehicles, dogs and tear gas canisters. Camera crews from CNN, Al Jazeera and the BBC followed suit. Months later, when a grand jury found police officer Darren Wilson justified in the shooting, the scene repeated itself with more fury and fire. Within days, a small municipality nestled in North St. Louis County’s suburban sprawl became center stage for bubbled-over racial strife in America. Words like use-of-force, body camera, police militarization and municipal court all vaulted into the national lexicon. A burgeoning movement rallied around the common sense, yet somehow controversial, demand that Black Lives Matter. 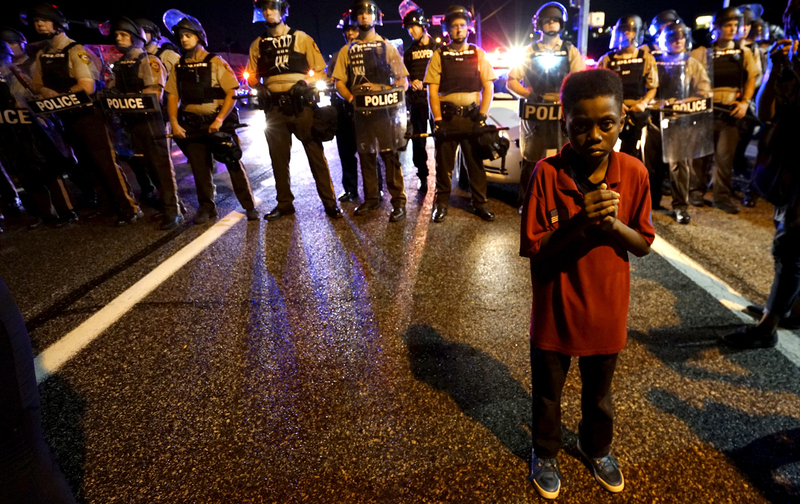 Young activists kept up the pressure in St. Louis. And when black men and women died in police shootings or police custody in other parts of the country—Cleveland, North Charleston, Baltimore, Cincinnati, Waller County, and Arlington—the names of the deceased became impossible to ignore. After night fell in Ferguson on Sunday, a day of peaceful remembrance ended in violence. Official reports say officers returned fire at an 18-year-old, critically wounding him, after he fired shots at a police SUV. According to the St. Louis Post-Dispatch, the shooter, Tyrone Harris, is in critical condition. Despite last night’s violence, the weekend of marches and memorials offered community members time to reflect on the year in which Ferguson became an international symbol. Residents, protesters, and officials who spoke with The Nation expressed a range of views, from ambivalence to hope, about whether Michael Brown’s death brought forth positive change. “I hate that it had to come to this for change, but the police have changed. They don’t even stop me anymore,” said Ryan Walls, 29, standing feet away from the spot where Brown died. Walls works as a cook at Busch Stadium, which was one of many public destinations in St. Louis that saw Black Lives Matter protests this year. After the Justice Department released a scathing report of Ferguson’s police and municipal court practices, its city manager, judge and police chief all resigned. Wesley Bell, one of Ferguson’s two newly elected black council members, said the acting officials who have filled those vacancies have already worked on correcting some of the practices that fell under heavy scrutiny last year. The Los Angeles Times reported fines in Ferguson are down as much as 60 percent from last year. In their report, Justice Department investigators verified what many residents already suspected: Ferguson police acted as de-facto revenue collectors, disproportionately burdening black residents with citations. Under pressure from city officials, aggressive policing and excessive ticketing was norm. Other reports showed how this problem also afflicted neighboring municipalities in North St. Louis County, not just Ferguson. Missouri Governor Jay Nixon signed a bill to curb some of the draconian practices in the region’s municipal courts. Starting August 28, revenue from traffic fines for St. Louis County municipalities cannot surpass 12.5 percent; the rest of Missouri will be capped at 20 percent. The reforms will also limit fines and court costs from traffic tickets to $300 and ban the practice of jailing those unable to pay. Other attempts to address problems revealed by Ferguson have not been as successful. Missouri lawmakers filed more than sixty bills inspired by last year’s protests, but only court reform passed into law, according to an Associated Press analysis. One of the bills that failed to move through the statehouse sought to make Missouri’s use-of-force laws compliant with a 1985 US Supreme Court decision. Other bills would have made body cameras mandatory and require special prosecutors to investigate officer-involved shootings. Last year, activists accused county prosecutor Bob McCulloch of being too close to law enforcement to objectively handle Wilson’s case. Nixon convened a 16-member commission to identify and study the social conditions underlying last year’s unrest. In a report slated for release next month, the Ferguson Commission will make recommendations to tackle structural inequality in St. Louis, from civilian oversight boards to a $15 minimum wage. Brittany Packnett, an activist and commission member, told The Nation that the group’s effort should be seen as proof that protests work. Since last year’s shooting, droves of residents moved away from the neighborhood where Michael Brown died. But Wanda Edwards, 58, couldn’t afford to leave. On Saturday afternoon, Edwards watched from her porch as protesters gathered around Michael Brown’s memorial for a five-mile march to Normandy High School, where he had graduated just days before his death. Edwards still remembers the exact moment, one year ago, when she walked to this same spot, facing the road, and saw Michael Brown’s body on the street.